The Pillow Collection QUEEN-d-paboreal-coral-c95-l5 Coral Ieesha Animal Print Bedding Sham, Queen/20" x 30"
Spread this accent sham to your living space and create a contemporary design. 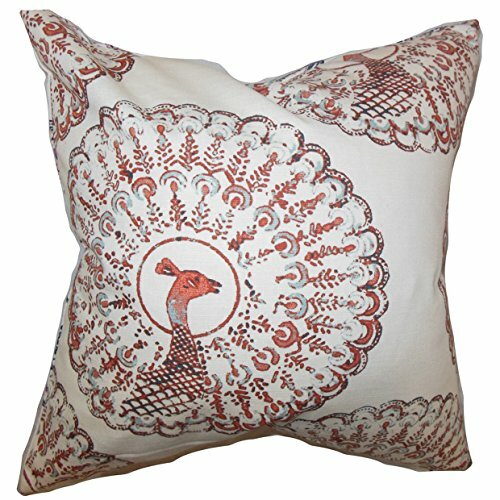 This throw sham features a peacock pattern in shades of coral, blue, black and white. Pair with florals, solids and toiles for a dramatic decor style. Made from a blend of 95% cotton and 5% linen fabric. This 18" sham is crafted in the Details: Reversible sham with same fabric on both sides. Nbsp; Includes a hidden zipper for easy cover removal and cleaning. Nbsp; Comes unfilled and will accommodate any standardized Euro, standard, queen and king pillow insert. All four sides have a clean knife-edge finish. Nbsp; Made in the ; Dry cleaning recommended. If you have any questions about this product by The Pillow Collection, contact us by completing and submitting the form below. If you are looking for a specif part number, please include it with your message. The Pillow Collection QUEEN-d-paboreal-sapphire-c95-l5 Sapphire Ieesha Animal Print Bedding Sham, Queen/20" x 30"
The Pillow Collection KING-ROB-CARAVAN-COPPER-C100 Naenia Animal Print Bedding Sham, Red, King/20" x 36"
The Pillow Collection Sand Agapi Animal Print Bedding Sham, King/20" x 36"
The Pillow Collection Brindle Ksenia Animal Print Bedding Sham, King/20" x 36"
The Pillow Collection Orchid Pesach Animal Print Bedding Sham, King/20" x 36"
The Pillow Collection Black Olesia Animal Print Bedding Sham, King/20" x 36"